. : Optics & Photonics Focus :: Checking the Weather of Alien Planets :. Which planets in the universe are habitable? Check the weather! It is now possible to know if extra-solar planets have earth-like weather by analyzing the signature the weather leaves in the light scattered by these planets. Measured cloud distribution of the earth. From outer space, clouds appear brighter than land and oceans because they reflect more light. Since the clouds are unevenly distributed in an earth-like planet, fluctuations in its brightness are expected. Picture courtesy: NASA. Weather is a fundamental ingredient for life on our planet. Without clouds transporting large quantities of water ultimately distributing water over the continents, wind transporting seed or lightning creating fire, our world would not be the same. Through the rotation of the earth, its global cloud system gives rise to periodic variations of the earth's scattered light for a distant extraterrestrial observer. This is a recent finding by Enric Pallé and his collaborators from the Spanish Instituto de Astrofísica de Canarias (IAC), the University of Florida and the Massachusetts Institute of Technology (MIT). In the search for habitable planets, this observation could be the basis for a unique photometric method for identifying weather activity on distant planets from other solar systems through variations in their brightness. Since the first detections of planets outside our solar system in the beginning of the 1990’s, the search for these so-called exoplanets has become a thriving research topic in astrophysics. However, because they are so far away and so faint compared to their host star — about ten to hundred million times fainter — only a couple of exoplanets have been observed directly, i.e. by actually observing their light in telescopes. Instead, most detections rely on indirect methods such as the gravitational influence on the host star or its partial eclipsing. For comparing exoplanets with the earth and for studying their habitability, a direct detection of their light is necessary. This light contains spectral features encoding crucial chemical information about the content of the planet's atmosphere, its soil composition, and the presence of ecosystems like forests. However, even though future space missions will allow direct observations, such spectral analysis is hampered. Because of their distance, exoplanets will at best be resolvable as point sources. In absence of further information, Pallé explains, "all the interesting local properties of the planet will thus be blended together in its integrated light." A characteristic of our planet is the presence of oceans, lands, and clouds, whose interaction results in a coupled system that we call weather. In particular, the stability of the oceanic and atmospheric currents results in a property which is unique in our solar system: "the earth is the only planet of the solar system with a broken cloud cover," Pallé points out, "and the averaged cloud dynamics is rather stable on the time-scale of the earth rotation period." Because clouds consist of dense ensembles of droplets, they reflect a lot more light than oceans or continents. In their study, Pallé and his colleagues addressed the question of whether the partial cloud cover of the earth would induce variations of its scattered light as the earth rotates, as seen from an extraterrestrial perspective. In this aim, they simulated for any viewing geometry the time variation of the light flux reflected by the earth as it rotates. 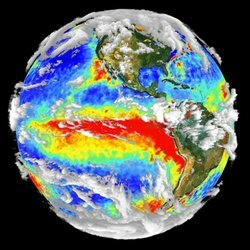 Their simulations include surface reflectance models accounting for snow/ice cover, together with real cloud data obtained from daily satellite observations collected over 20 years through the Satellite Cloud Climatology Project. Pallé's team showed that the flux of the light scattered by the earth relative to the solar flux exhibits a roughly periodic pattern as the earth rotates. These time variations would be sufficient to determine the rotation period of the earth with a precision of a few percents, depending on various observational parameters. These findings have strong implications for the search of habitable planets, provided they can be observed directly by a telescope. The observation of a quasi-periodic variation of the brightness in time would then suggest a partial cloud coverage of the planet. This would be confirmed by small fluctuations of the measured period influenced by the cloud dynamics, revealing the presence of an active climate similar to the one on earth. Furthermore, from the methodological point of view, knowing the rotation period would allow to sample the photometric light curves at the rotation period, thus providing a novel technique to indirectly study regional properties of the planet. "We could divide the rotation period into four time intervals corresponding to four distinct quarters of the planet, and then integrate the photometric and spectral information for these specific intervals over several periods," Pallé clarifies. Ultimately, such a method could reveal the presence of water oceans and lands in other worlds, with the hope to identify biomarkers such as large forests. "Until now, clouds were considered to be problematic for the study of habitability of exoplanets, as their high reflectance would mask information about the surface," comments Antigona Segura, specialist in the atmospheres of potentially habitable planets at the Instituto de Ciencias Nucleares of the Universidad Nacional Autónoma de México. "But the work of Pallé shows that if the cloud cover is partial, the determination of the rotation period opens the door for the retrieval of spectral properties from different zones of the planet, and in particular from its surface and nearby atmosphere!" Future direct observations of exoplanets need to be carried out from space, in order to eliminate the atmospheric stray-light of the star companion that smears out the light of the planet. ESA's Darwin mission and NASA's Terrestrial Planet Finder mission, aiming at the direct observation of exoplanets and the characterization of their surface and atmospheres, are currently being discussed. However, "more background research and testing is necessary before the space agencies will invest in such missions," Pallé points out, "but it is only a matter of time until we can see further and deeper into the universe, and it will be inevitable that such space missions happen in the next 100 years." The ensuing discovery of an earth-like planet would naturally raise the question of their habitability for some intelligent species and therefore have a profound impact on our vision of the universe. PK is currently working on his PhD in solar astrophysics at the Max Planck Institute for Solar System Research in Katlenburg-Lindau (Germany). E. Pallé et al., Identifying the rotation rate and the presence of dynamic weather on extrasolar earth-like planets from photometric observations, Astrophys J (2008) 676, 1319-1329 (link).